House Expenses List: You Can Afford a Home! If you’re new to homeownership, you may find that there are more bills than you originally expected. 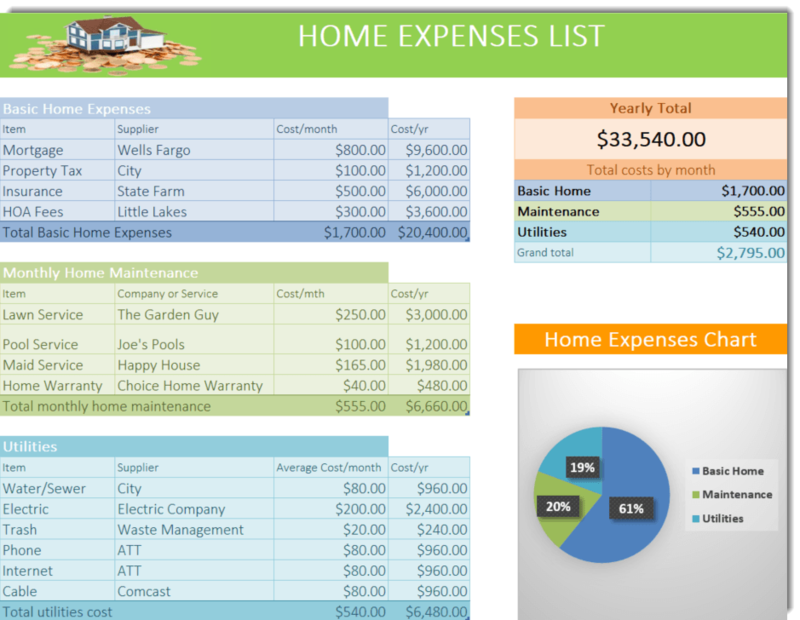 Drafting a complete house expenses list goes far beyond the basics like utility and water bills. You’ll have a whole host of new costs to think about, though these also come with a new level of freedom. Though you’ll have to handle yard maintenance, you’ll finally get to plant your dream garden. You might pay for recycling, yet have the opportunity to choose a more comprehensive pickup service. To make sure your new home budget is on track, here are a few of the costs you should plan for in your new home. Property taxes pay for all the programs and services that make your community a great place to live. Your property taxes can be paid in various ways, so it’s important to understand how you’re handling this expense. If you have a mortgage, your lender may set up an escrow account for estimated property taxes. Every month you’ll pay a portion of the property taxes so you’re not hit with a big bill all at once. The loan servicer pays your property taxes from this account. Of course, no system is perfect. If the loan manager doesn’t pay the sum on time, it can result in late fees. Keep a close eye on your escrow account and follow up to make sure it’s handled correctly. If you’re paying property taxes yourself, you may want to follow the escrow example and set aside a portion of the expected sum each month so you’re prepared when taxes are leveraged. Looking at past property taxes for a home will give you an idea of what to expect. However, you should keep in mind that tax rates can increase unexpectedly. Some districts will allow you to pay your taxes in installments so if you would prefer that, check with the city and county to see if that option is available. Your property tax payments will go up if the value of your home increases for any reason. For example, a major home renovation will likely increase the amount of your annual property tax. Many municipalities and counties offer protection against sharp tax increases with homeowner’s exemptions. Check into the availability of that in your area and make sure you take advantage of any savings. In some cases, you may have the option of shopping around for the most affordable service. A large area might have multiple internet providers or trash services. Get estimates for these bills when planning your home buying budget so you’re prepared for the future costs of maintaining a comfortable home. When you own a home, you’re responsible for maintaining all aspects of it. This includes roof repairs and upgrades, regular gutter cleaning, annual or monthly pest maintenance, and landscaping. You may be able to do some of these tasks yourself or you might prefer to hire a professional. From power washing the siding to regularly treating the deck, you’ll need to budget for the supplies to handle it as a DIY job or the service fees to call in a pro. Home ownership comes with a slew of additional – and often unexpected – expenses associated with regular maintenance and upkeep. You’re responsible for all the tasks that a landlord would take care of in a rental. In addition to routine care and maintenance, you’ll also need to take care of the occasional repair or replacement. Major appliances like your water heater, cooktop, oven, and dishwasher can break down without warning. Budgeting ahead for these issued will help you handle them with ease. If you don’t want to worry about keeping an adequate emergency fund in place for these types of situations, consider investing in a home warranty instead. A Basic Plan from Choice Home Warranty covers your heating, electrical, and plumbing systems as well as many essential appliances. The Total Plan includes additional appliances like your refrigerator, clothes washer, and clothes dryer. With a home warranty, you know exactly how much you’re paying. Whether you need a minor repair or a complete replacement, your fees are the same. This gives you peace of mind and protection from the unexpected. A new home is likely the most expensive thing you will ever buy and very few prospective homeowners are in a position to pay cash for a home. The vast majority of new homeowners take out a mortgage. Mortgage costs vary depending on your credit score and the prevailing rates. The good news is that once that rate is locked in, this is an expense that will stay constant. Just remember to add it to the list of monthly expenses. Mortgage companies require that you maintain a homeowner’s insurance policy. When you purchase a home, you typically buy the first year’s insurance and roll it into your mortgage. This makes it easy to forget about this expense for those 12 heady months settling into your brand-new home. Going forward, you’ll still need to maintain an active homeowner’s insurance policy. However, you’ll typically have the opportunity to set up monthly or quarterly payments rather than annual payments going forward. Don’t forget to include this expense in your annual budget. Average insurance rates vary by location. The national average is $1,228, but state averages range from a massive $3,575 in Florida to just $337 in Hawaii. If you’re purchasing a condo or a home in a planned community, you may find that it’s managed by a homeowners association, or HOA. The HOA helps to maintain shared amenities like a neighborhood pool or clubhouse, as well as landscaping, sidewalks, and other features in common areas. HOA fees are typically charged on a monthly basis. When you’re shopping for a new home, you should tack HOA fees on along with your monthly mortgage payment to determine whether you can afford a home in a particular area. In 2015, the average monthly HOA fee was $331. The higher your home value, the greater your HOA will probably be. There are many advantages to living in a managed community, but you should make sure your budget properly for these perks. Your realtor can help you understand how HOA billing works in your community. Though it’s impossible to draft a perfect house expenses list, you can prepare yourself for many of the costs of homeownership by investing in insurance and warranties that protect you from what you can’t predict. Choose the right protection and keep an emergency fund on hand and you can be confident that you are covered when it comes to maintaining and protecting your home.